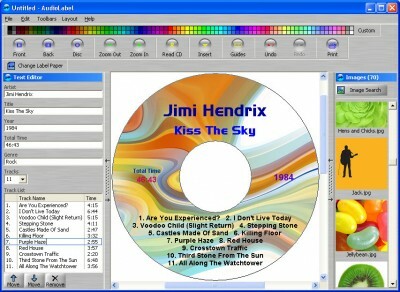 AudioLabel is smart cd label software that helps you create and print a cd cover or jewel case insert. AudioLabel is smart cd label software that helps you create and print a cd cover or jewel case insert. Our cd label maker has been specifically designed for the audio enthusiast. AudioLabel can automatically find your album information (artist, title, and track list) and fill out the label for you. Easily add your own images, art work, or photos using the integrated thumbnail viewer. AudioLabel includes a cool art gallery and also has an image search function that can scan your computer for thousands of images. Album information can be retrieved from the Freedb internet database, CD-Text and CDPlayer.ini file. Our cd label creator can even read and label your MP3 CDs using the ID3 tag and filename. Unlike other cd labeling software, youll never be locked into a particular brand of label paper. All popular brands are supported and even non-standard labels can be adjusted using the Label Alignment Wizard. No matter what kind of paper, our cd cover maker can print your labels with ease. A complete office solution for all your labeling and printing needs including labels, barcodes, photo ID cards, and more. Indentsoft Label Maker Plus is a professional quality business printing software. Select from over 2500 label templates, add barcodes to labels, mail merge with virtually any database via ODBC, OLE DB and direct database connectivity. Select from over 2500 label templates, add any of 15 industry standard barcodes (UPC-A, CODE-39, CODE-128, EAN-13, POSTNET, etc. Sticker and Label/ Stationery Store Update Version 1.